Most almond butter is made from ground, roasted almonds. When eaten in moderation, almond butter can be a healthy addition to any diet. Not only is it a good source of vitamins and minerals, but it's also an excellent source of heart-healthy fats. Use almond butter in lieu of peanut butter in sandwiches, add it to smoothies or include it in baked goods. One tablespoon of almond butter has 100 calories, 10 grams of fat, 2 grams of protein, 4 grams of carbohydrates and 1 gram of fiber. Based on a 2,000-calorie diet, it also provides 10 percent and 8 percent of the daily values for magnesium and phosphorus, respectively, as well as 4 percent each of the daily values for calcium, iron and zinc. Almond butter also contains trace amounts of several important B vitamins. Although almond butter contains a high amount of fat per serving, it's primarily heart-healthy unsaturated fat. The American Heart Association recommends getting 25 to 35 percent of your daily calories from fat, with unsaturated fats as the primary source. Replacing saturated fats found in animal products and trans fats found in processed foods with unsaturated fats may contribute to lower cholesterol and a healthier heart. Although almonds and almond butter are calorie-dense, they don't seem to contribute to weight gain. Purdue University researchers studied the effects of adding 360 calories of almonds to participants’ daily diets. After 10 weeks, the almond-eaters experienced no significant change in weight. The researchers concluded in a report published in a 2007 issue of the British Journal of Nutrition that the almond intake increased feelings of fullness so participants ate fewer calories at other meals. In addition, the Purdue scientists found that some of the calories from the almonds pass through your body unabsorbed, and therefore can't be stored as extra weight. Including almonds or almond butter in your diet may help you improve your overall nutritional profile. A study published in the British Journal of Nutrition in 2004 found that people who included 52 g of almonds daily for 6 months also improved their overall nutritional choices and increased their intake of fiber, vegetable protein, unsaturated fatty acids and magnesium. 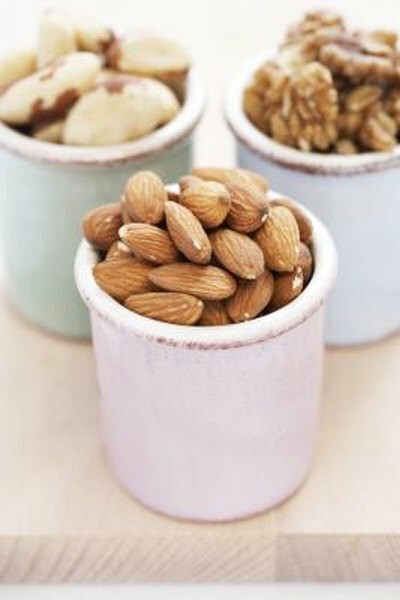 Intakes of trans-fats, animal proteins, sodium, cholesterol and sugars also decreased when almonds were added to the diet. Researchers did not direct these dietary changes, rather they occurred spontaneously. Some manufacturers add sugar, salt or hydrogenated oils to improve the palatability of almond butter. Choose natural butter to benefit most from its nutrition and avoid additives. Some of the oil in almond butter may separate during storage -- simply stir before using. Almond butter requires refrigeration after opening.